Synopsis The story of the original manga begins after 70% of the moon was suddenly vaporized in an explosion. The super lifeform responsible for this catastrophe is a strange tentacled creature that can slink around at supersonic Mach 20 speeds. 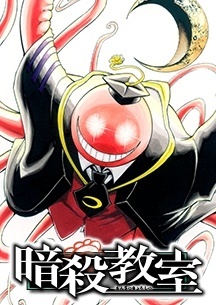 It has a 10 billion yen (US$100 million) price on its head, but for some reason, this creature ends up teaching a middle school class at the beginning of the school year. The students have until graduation to assassinate the teacher, or it will destroy Earth as well. The first event anime special adapts the original manga's popular segment about the field trip to ancient Kyoto.